– Seeing in Black and White Article by William Neill who has been shooting in the west for a long time. Taken on a Saturday at Hunt Valley Mall at an informal gathering of sports car enthusiasts. Composite of a horizontal “swipe” of fall trees at a pond, and a tiny island at Hidden Lake on a foggy morning. 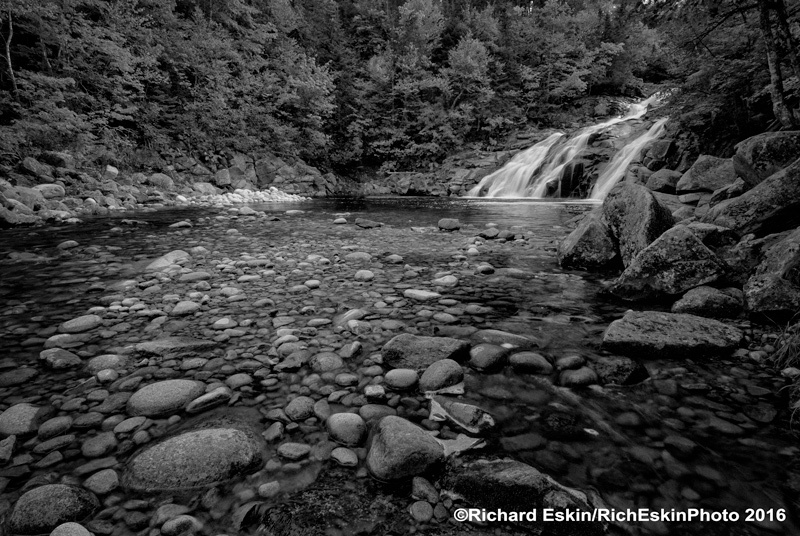 – Clyde Butcher photographs in the Delaware River Water Gap in PA Interesting because I was up there this weekend for a workshop with John Barclay. – Do you still need physical filters? At Child’s Fall Park in the Delaware River Water Gap, PA, taken at a workshop with John Barclay. – For the Dog Lovers Among Us I really enjoyed this one. Hoen Lithograph building, with a bit of atmosphere added. The member’s show at the Baltimore County Arts Guild at 1101 Maiden Choice Lane, second floor above the bank begins this week. I will be there with refreshments from 11 – 2 on Sunday, June 26. Please stop by and say Hi! Suzanne Morgan, a jeweler will also be there. “We are each the average of the people we hang out with and the experiences we choose. – Perfect Panoramas Panoramas are a great tool to get the best out of some scenes that just don’t compose well in the standard aspect ratio. When I had my first solo exhibition of my paintings and photographs, I felt that the act of working as an artist is not complete until the works have been given for viewing. They are not given as a need for affirmation, but a need for connection. … It simply should not remain in a closet, lifeless and unchallenged. f11, Feb. 2016, Issue 51, p. 106 — Paula Chamlee. Composition This video is about cinematic composition but is applicable to stills as well. I thought it was well done. Why You Shouldn’t Date a Photographer I couldn’t resist including this one! The cargo cranes and the industrial chimney speak to me of Baltimore’s industrial past and future. Portfolios of Blind Photographers – Pete Eckert’s story is particularly poignant and inspiring. This was taken in Nova Scotia. The area was a pleasant mix of countryside and small towns. The O’Neil collection from Baltimore collectors Tom and Nancy O’Neil. Approximately 20 images with broad themes that embody the interactions of humans and the environment (e.g., Misrach, Schutmaat, Kirkeby, Tice, Burtynsky), and portraits that reveal people’s struggles and achievement (Chao, Bey, Anderson & Low), and a few that don’t really fit in either category. On exhibit until March 27, 2016. Late 20th Century Photographs from Russia and Belarus. Several other New Arrivals exhibits include single prints from Stephen Shore and William Eggleston, three large prints from Burtynsky, four images from Dorothea Lange’s FSA work in Oregon, and two small works by Edward Stieglitz. The first, as described above of human and environment interactions, included Misrach’s Holy Rosary Cemetery, Schutmaat’s Abandoned Homestead, Hatakeyama’s Blast (stop action limestone blast), Kirekby’s To and From (transmission lines reminiscent of Callahan’s minimalist work), Tice’s Water Tower and White Castle, probably Matthew Pillsbury’s Jane’s Carousel, Ulrich’s Kenosha Wisconsin big box store and Burtynsky’s Oxford Tire Pile could have been grouped together. All have representations of ecological consequences of human activities on the environment. This would certainly be more a grouping of theme and intent rather style or technique, because both varied widely. The contrast for example of Kireby’s almost delicate image of transmission lines with Burtynsky’s massive tire pile filled with detail is an extreme contrast. Hatekeyama’s Blast ties the environmental destruction of exploding limestone with implied construction of roads and buildings using the limestone. Tice’s contemporary architecture combines well with Ulrich’s image of the interior of the big and the implications for consumption, waste and banal architecture. The second grouping are the portraits of which two really stood out to me: Dey’s large format portrait of Shalanta and Chao’s of a Buddhist monk Taken with a large format camera, Shalanta was accompanied by statement from the subject. The image truly reflected her positive approach to life. Schutmaat’s portrait of a Wyoming man also works well with this group. Anderson and Low had a diptych of a star Naval Academy lacrosse star in protective gear and in dress uniform, connecting or contrasting the athlete and the warrior. The third group seemed to be more of technique and and style than of theme, without any real connection other than disparate approaches. Abelardo Morell converted a room into a camera obscura to capture street scenes. The image was displayed inverted as it was taken, and with the softness and lack of sharpness resulting from imaging without a lens, seemed surrealistic. Thomas Kellner took individual 35 mm color negatives of sections of the Lincoln Memorial and then assembled the negative strips to create a fragmented, disjointed image of the memorial; very interesting approach of dis-assembly and re-assembly. Welling’s abstract of draped velvet and Lyons use of the flag “After 9/11” were interesting images more as an examples of contemporary work than of any coherent theme. Approximately 22 photographs including photographs from Lithuania and Ukraine as well Russia and Belarus from 1959-2000. In general, the images were not exceptional except for being images of a time and place in the Soviet Union where things were controlled by the State and these were unofficial pictures. I thought the two images by Galina Moskaleva were the best of the group, although extremely different. The first was from a series of young people who had been exposed to radiation and had to have their thyroid removed. The second was of two children repeated and colored. I didn’t understand the curator’s placement of these images by the same photographer, separated by a grouping of four images by a different photographer. It would have been easier to compare the evolution of Moskaleva’s work if they were adjacent. These were scattered though the museum. The most arresting were three large prints by Burtynsky (Silver Lake Operations, Rock of Ages and Shipbreaking). The two by Shore (Holden St., North Adams, MA) and Eggleston (Untitled, from Troubled Waters) were also a well-considered comparison of mid-20th century urban scenes transformed by light. The four small images by Dorothea Lange, taken during her time with the Farm Security Administration were all of dwellings during the depression in Oregon; one of an exterior and three interior, and provided some interesting insight into life at that time. Finally two small images by Edward Stieglitz; one of his wife George O’Keefe and of another artist, Marsden Hartley. If you are interested in photography these current exhibits at the BMA shouldn’t be missed. Please see our seminar Facebook event https://www.facebook.com/events/1548390072152751/ and share it with your friends. On the right side, just under the header where is says “Invite.” Just click and a list of your friends will drop down. Click on those you think might be interested or on all of them and and ask them to spread the word.